This review first appeared in the November 11, 1994 issue of the North County Blade-Citizen (now North County Times). 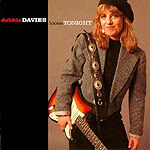 Former Albert Collins protege Debbie Davies' second album should firmly establish her as one of the best blues guitar slingers playing today. Her leads are clean and sharp, her solos full of punch. The songs on "Loose Tonight" should also bring Davies increased recognition as a first-rate composer. Her perspective on love and life should also be welcomed to the male-dominated blues world  isn't it about time we had songs like "This Man Is Killin' Me" and "A Mother's Blues"? It's even better that these are catchy songs with hook-laden melodies. As a vocalist, Davies can't live up to the quality of her guitar playing or songwriting. Her voice often misses notes, and while earnest, her singing lacks any real emotional impact. Still, the outstanding guitar playing and great songs on this release outweigh the so-so singing.